form of gambling and smashed several machines in a publicity stunt. I laughed and snapped a photo to send to JD. to discuss what exactly that something was. It all began several months ago. JD and I went out for dinner to a little Indian restaurant in the East Village. he told us to try not to drop any silverware as it may take out the hostess. shake your head and say "Really? Who attempts ironing a shirt already on your body?" 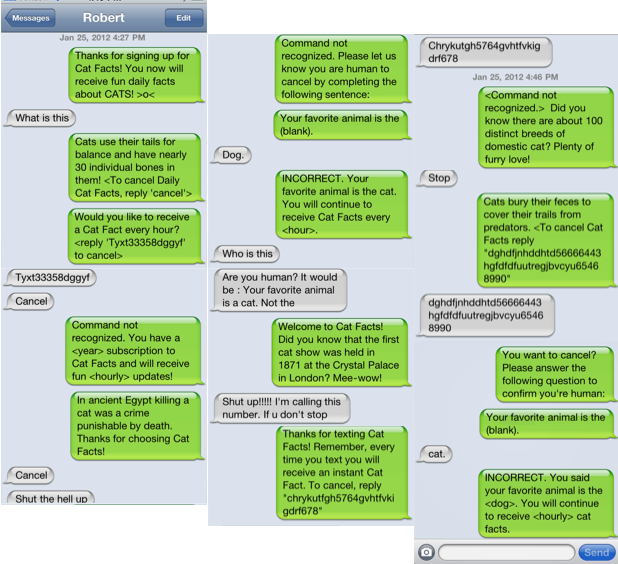 fun facts about cats every hour, a "subscription" that is impossible to cancel. The original post on Reddit. wanted to try it ourselves, except we took it a step further. Instead of sending true facts, I suggested that we make up our own. The key was striking the perfect balance between fact and fiction. and statistics with completely crazy made up facts. a quick google search would prove that at least some of the info is right. into the subway system in an attempt to reduce the growing rat population. most often in the tunnels north of 125th Street. but nothing beat having my mother tell me about cats being able to read. domestic cats that do not have tastebuds. towards Dr. Suess' "Cat in the Hat". sank in 1912, 37 of the 53 cats on board were lost at sea. Sadly, the official count does not include likely stowaways. Did you hear of this joke? Did you play it? Hahah omg! I literally laughed out loud at the Cat Facts on Reddit! Too funny! Seriously! I can't stop laughing about this! Such a great trick to play. Who knows, maybe you would find one of those rare people who would love to receive cat facts every hour.